Methane produced in sediments beneath the Greenland Ice Sheet is released to the atmosphere by meltwater in the summer. This suggests that glacial melt could be an important global source of this greenhouse gas. Lauren C. Andrews is in the Global Modeling and Assimilation Office, NASA Goddard Space Flight Center, Greenbelt, Maryland 20771, USA. Sediments beneath glaciers and ice sheets harbour carbon reserves that, under certain conditions, can be converted to methane, a potent greenhouse gas. However, the formation and release of such methane is an unquantified component of the Arctic methane budget. Writing in Nature, Lamarche-Gagnon et al.1 present direct measurements of dissolved methane in water discharged from a land-terminating glacier of the Greenland Ice Sheet during the summer. This water, which is known as proglacial discharge (Fig. 1), was supersaturated with methane, and the amount of methane released to the atmosphere from this discharge rivals that from other terrestrial rivers. The findings suggest that the form and evolution of subglacial hydrological systems contribute to the control of the Arctic methane cycle. Atmospheric methane concentrations varied substantially in the past, and it has been hypothesized2 that large reserves of methane can form and be trapped under ice sheets and glaciers when there is a favourable combination of carbon-rich sediments, high subglacial pressures, oxygen-poor conditions and low temperatures. 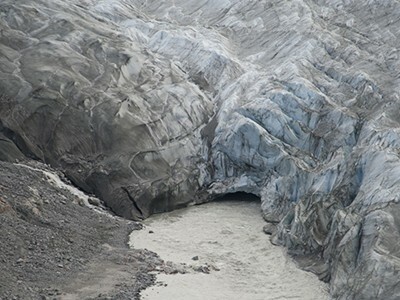 Rapid release of this methane during glacial retreat might trigger rapid warming3, but whether large-scale release of such glacial methane could occur in the future is disputed4. Field observations provide equivocal evidence for whether subglacial sediments act as a source or sink of methane. Ice-core drilling operations in West Antarctica detected methane-producing microbes in proglacial and subglacial sediments5, but analyses of Antarctic subglacial lake sediments6 and proglacial sediments7 indicate that bacterial oxidation consumes almost all the methane produced, preventing its release to the atmosphere. This bacterial methane cycling suggests that the subglacial hydrological system could serve as a methane sink. Lamarche-Gagnon et al. show that subglacial microbial oxidation of methane is not sufficient to mitigate the gas’s release to the atmosphere within a well-characterized subglacial catchment (an area within which subglacial water collects and drains out of a common outlet) in Greenland. Subglacial sediments can therefore act as a local source of methane, corroborating the results of other recent studies of subglacial methane8,9. Lamarche-Gagnon et al. go further by demonstrating that the continuous flux of methane from the Greenland subglacial environment varies with the efficiency of subglacial meltwater drainage. Near the margins of the Greenland Ice Sheet, the glacial hydrological system seems to be well suited to exporting methane. During winter, some meltwater from previous summers is stored in the inactive subglacial hydrological system10. Lamarche-Gagnon et al. hypothesize that this winter storage allows meltwater to become enriched with methane through interaction with sediments in an oxygen-free environment. In the spring, the subglacial hydrological system reactivates when it is flooded by the drainage of surface meltwater through crevasses and moulins (vertical conduits that allow meltwater to flow from the glacier surface to the bed beneath the ice sheet). This flooding causes an increase in ice motion11, and Lamarche-Gagnon and colleagues show that this flushes the methane-enriched, subglacial water to the ice margin. The authors observed multiple distinct flushing events after the activation of the subglacial hydrological system, suggesting that various types of meltwater pulse — drainage of lakes on the ice surface through moulins, rapid surface melting during warm spells, and upstream expansion of active subglacial water systems — can liberate subglacial methane. The observations indicate that methane concentrations tend to peak following sediment-rich proglacial discharge. The slight delay between peak methane export and proglacial discharge suggests that drainage of methane-rich water occurs just after the lateral flow of water that is associated with the greatest ice motion, and during times when differences in water pressure allow the drainage of normally isolated regions of the ice-sheet bed into enlarged subglacial channels12,13. Lamarche-Gagnon et al. posit that the formation and growth of subglacial channels permits the rapid evacuation of stored methane-rich meltwater, limiting the amount of time that it is exposed to the oxygen-rich subglacial hydrological system in which bacterial oxidation occurs. The effect on the atmosphere of the export of subglacially produced methane — and of any future growth in this methane release associated with ice-sheet retreat — will depend on several as-yet-unconstrained factors. The potential increase of methane production and export in Greenland might be limited by the area of liquid water that can form at the ice-sheet bed14. The extent of carbon-rich sediments beneath ice sheets and glaciers is also unknown, particularly in Greenland, where both sediments15 and hard beds16 have been observed. Any increase in the proglacial methane flux from either Greenland or Antarctica will probably require a long-term expansion of subglacial hydrological systems that can efficiently evacuate stored meltwater. In Greenland, efficient subglacial drainage typically extends about 40 kilometres from the ice-sheet edge. 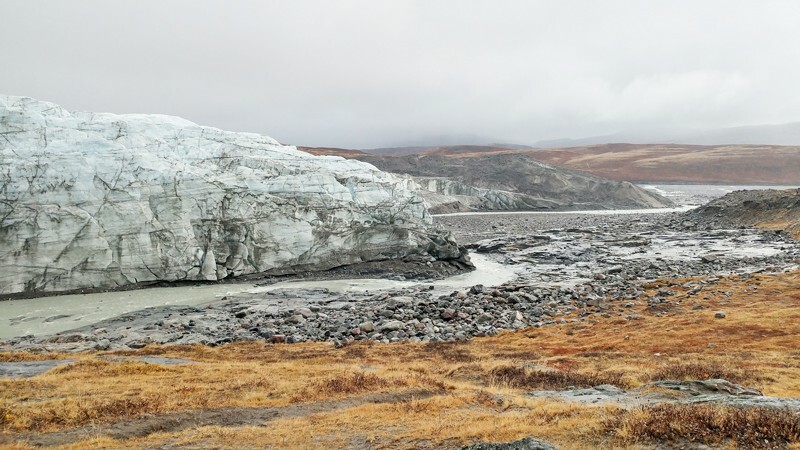 Surface meltwater production in Greenland will continue to expand17, but the surface and basal topography of the ice sheet might limit the extent of efficient subglacial drainage18, and the nature of the ice flow could limit surface-to-bed connections19. Antarctica has extensive regions of subglacial sediments and liquid water. Increased surface meltwater and surface-to-bed connections in the future might encourage more-efficient subglacial drainage in regions where methane is produced and stored. However, any increase in subglacial methane mobilization could be mitigated if water flow is slow or if subglacial basins are large, thus allowing more-complete bacterial oxidation of methane to occur. In such scenarios, subglacial methane export might be limited to regions near the ice terminus. Lamarche-Gagnon and colleagues’ study provides an example of how our planet’s icy domains can interact with the surrounding Earth system in unexpected and potentially important ways. Modelling and observational studies that characterize the ability of subglacial sediments to convert and store methane, and the ability of the subglacial hydrological system to export this methane to the atmosphere, will be key steps towards improving our knowledge of the sources and sinks of Arctic methane — and better constraining estimates of their future changes. Lamarche-Gagnon, G. et al. Nature 565, 73–77 (2019). Wadham, J. L. et al. Nature 488, 633 (2012). Weitemeyer, K. A. & Buffett, B. A. Glob. Planet. Change 53, 176–187 (2006). Petrenko, V. V. et al. Nature 548, 443–446 (2017). Christner, B. C. et al. Nature 512, 310–313 (2014). Michaud, A. B. et al. Nature Geosci. 10, 582 (2017). Dieser, M. et al. ISME J. 8, 2305–2316 (2014). Christiansen, J. R. & Jørgensen, C. J. Sci. Rep. 8, 16623 (2018). Burns, R. et al. Sci. Rep. 8, 17118 (2018). Chu, W. et al. Geophys. Res. Lett. 43, 12484–12492 (2016). Hoffman, M. J., Catania, G. A., Neumann, T. A., Andrews, L. C. & Rumrill, J. A. J. Geophys. Res. 116, F04035 (2011). Cowton, T., Nienow, P., Bartholomew, I. & Mair, D. J. Glaciol. 62, 451–466 (2016). Hoffman, M. J. et al. Nature Commun. 7, 13903 (2016). MacGregor, J. A. et al. J. Geophys. Res. Earth Surf. 121, 2015JF003803 (2016). Walter, F., Chaput, J. & Lüthi, M. P. Geology 42, 487–490 (2014). Harper, J. T., Humphrey, N. F., Meierbachtol, T. W., Graly, J. A. & Fischer, U. H. J. Geophys. Res. Earth Surf. 122, 2017JF004201 (2017). Leeson, A. A. et al. Nature Clim. Change 5, 51–55 (2015). Meierbachtol, T. W., Harper, J. & Humphrey, N. Science 341, 777–779 (2013). Poinar, K. et al. Geophys. Res. Lett. 42, 2015GL063192 (2015).